. 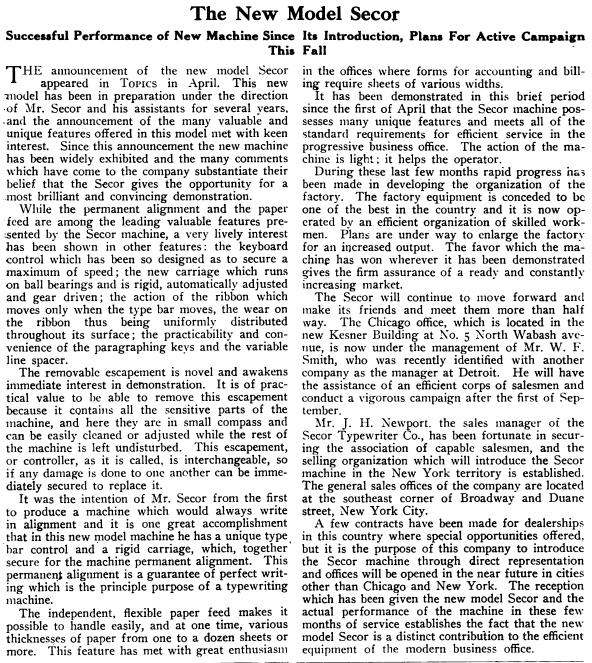 Tardy industrial relations, the legacy of a toolmakers' strike in October 1907 over Secor's arbitrary return to a 10-hour day from a nine-hour summer agreement. It was certainly some challenge ... but Secor was known to be one of America's ablest engineers. 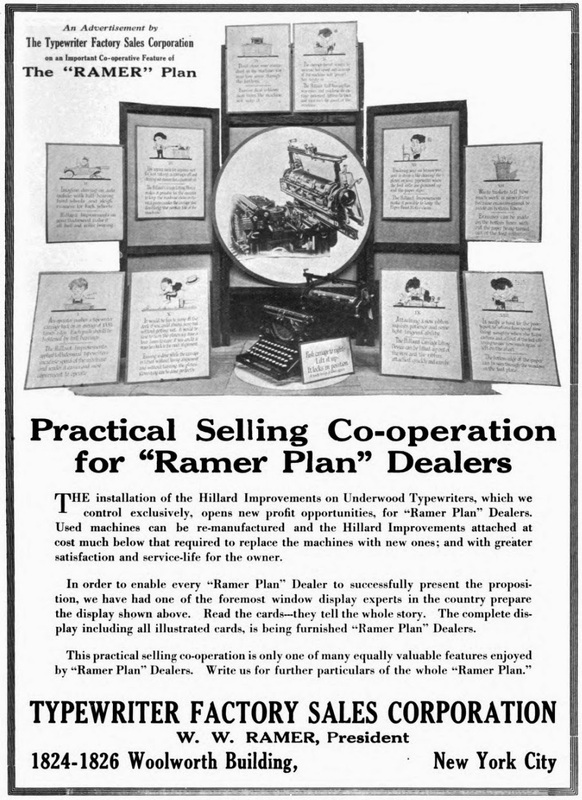 Once he had turned that engineering expertise to vastly improving his typewriter, he then had to develop more assertive business acumen. And he was to prove more than willing to lop heads to get what he wanted. One of them belonged to his original choice as general sales manager, Lee Kingsley. 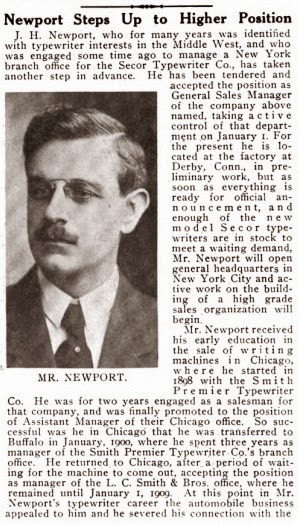 Secor further showed how ruthless for success he had become by headhunting J.Herbert Newport, a former Smith Premier and later L.C.Smith manager in Chicago, to take the sales reins from Kingsley. Confidence in the new Secor began to rise, and with it the capital stock, from an initial $30,000 to more than half a million. 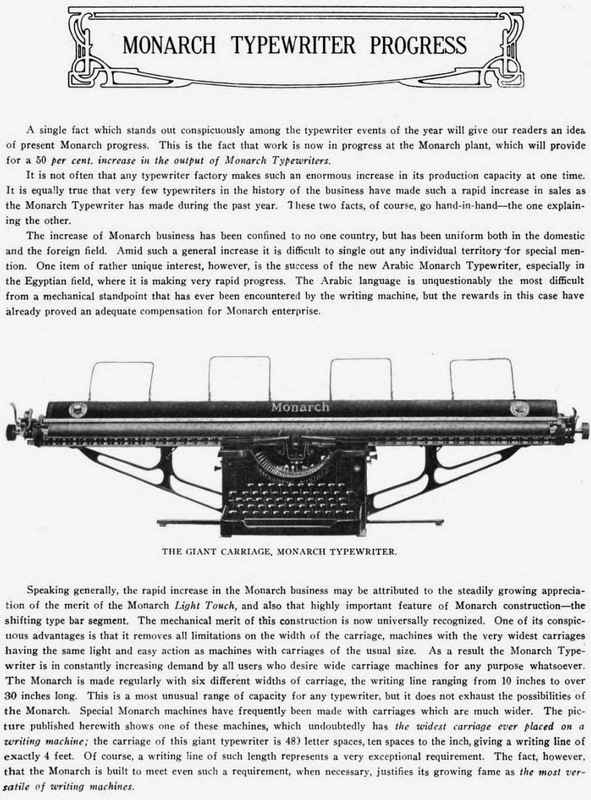 The major backers of the revitalised typewriter enterprise were the Ousatonic Water Power Company (not Housatonic, as stated by Typewriter Topics), represented by dam engineer Daniel Seymour Brinsmade (1845-1912) and his son Daniel Edwards Brinsmade (1874-1956), and Albert Emore Richardson (1844-1919) of Burlington, Vermont, a principal of drug company Wells Richardson, one of the largest drug companies in New England, with offices in Montreal, London and Sydney. Richardson put his son Frederick Albert Richardson (1873-1943) in charge of the totally revamped typewriter organisation. 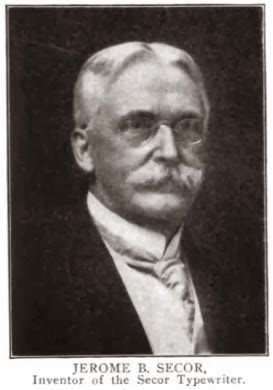 The vice-president was Charles Nelson Downs (1859-1924). Unfortunately, the selling battle of the future was all too soon lost. 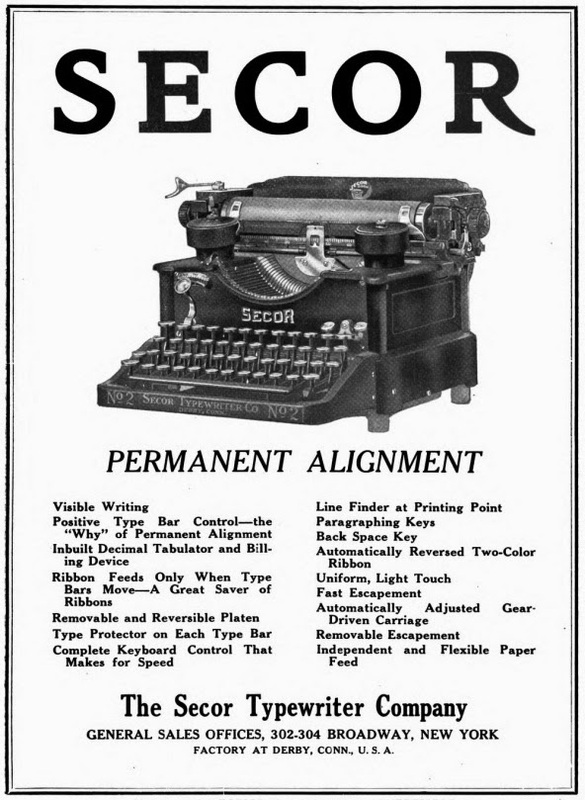 The Secor plant, also once the home of the Williams, was sold in December 1915 to Hudson Maxim's Maxim Munitions. It is perhaps, then, hardly surprising that Jerome Burgess Secor is far better remembered today as a brilliant toy designer than as an ultimate failure as a typewriter inventor. Secor was to be described as an "American mechanician extraordinary". But this was mainly because of his "extremely fascinating, extremely ingenious mechanical toys". 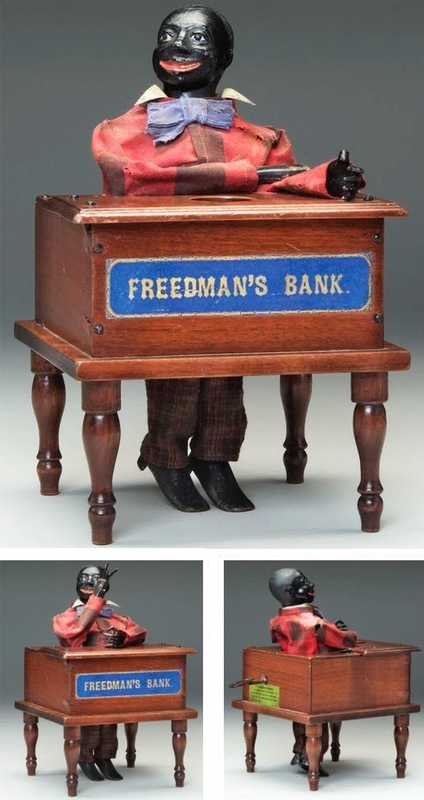 "Unquestionably, this is largely due to the fame of one of his products, the only mechanical bank which he ever manufactured, the Freedman’s Bank." Secor was certainly a pioneer of the American toy industry, manufacturing a series of intriguing mechanical toys from 1878 to 1882, "the finest toys of their kind which have ever been manufactured in the United States". Secor was born at Liberty Village, New York, on October 8, 1839. The family was of French Huguenot extraction. His father, Oliver, was a gun maker, and maintained a gun shop on Avenue A in New York. The family moved to Honesdale, Pennsylvania, where Secor attended Honesdale Academy, then to St Louis and Weston, Missouri, and finally to Peoria, Illinois. Among Oliver Secor's customers, according to family tradition, were Kit Carson and Jefferson Davis. In Peoria, Jerome Secor built and sold toy locomotives and boats. At 20 he took a job in the model room of a sewing machine factory in Chicago. 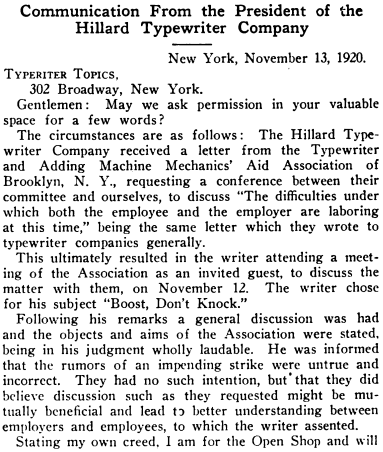 There he perfected a device to “take up” the tension in the machine, which he sold to the company for $1000. With this he opened his own small factory, but it was destroyed in the great Chicago fire of October 8, 1871 - Secor's 32nd birthday. 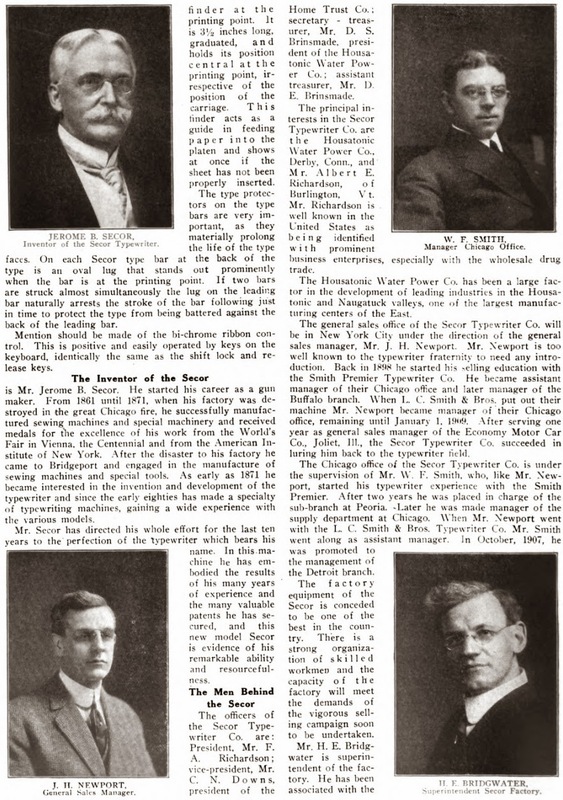 He moved to Bridgeport, Connecticut, and started the Secor Sewing Machine Company in East Bridgeport. Secor bought half of a double house on West Avenue in Bridgeport and found by chance that the owner and occupant of the other half was Edward Ives, well on his way to becoming America’s foremost toy maker. As a sideline to his sewing machine business, Secor started to manufacture mechanical singing birds in cages. 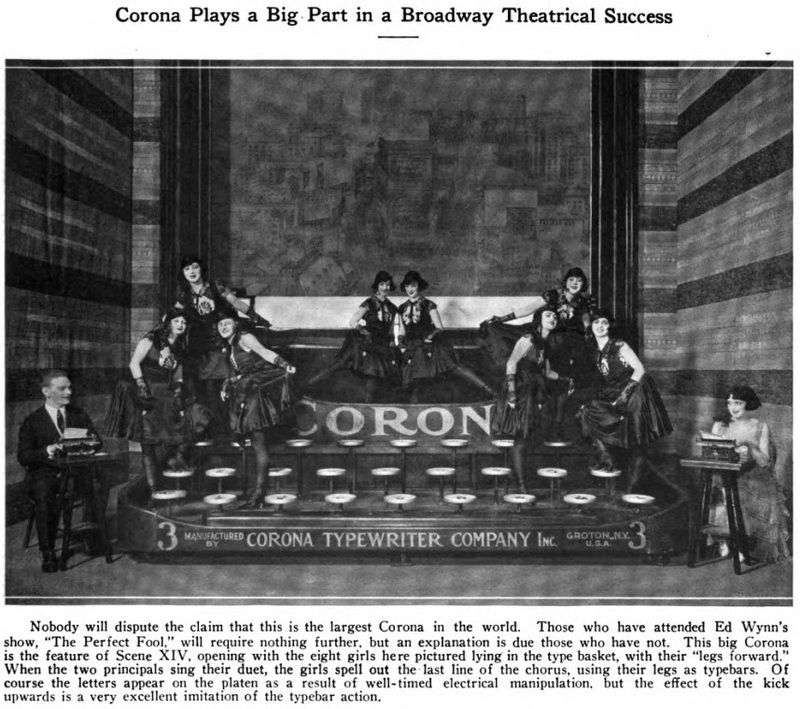 A music box in the base, for which Secor not only made the designs and tools, but also composed the tune, furnished the song. The birds were covered with real feathers and wired to perform lifelike movements in conjunction with the tune. After financial setbacks in the Panic of 1876, Secor closed his sewing machine plant and turned to toy manufacturing full-time. 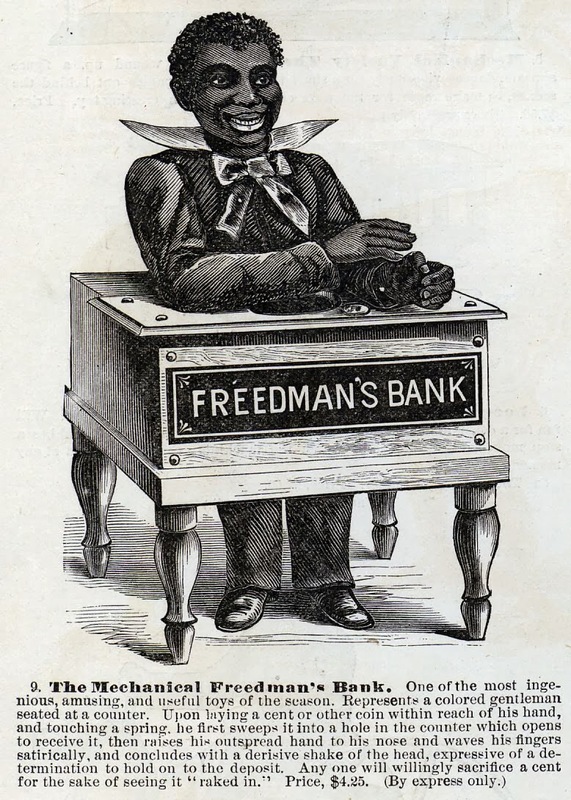 The Freedman’s Bank at one time sold for $66 a dozen wholesale and about $7.50 retail. 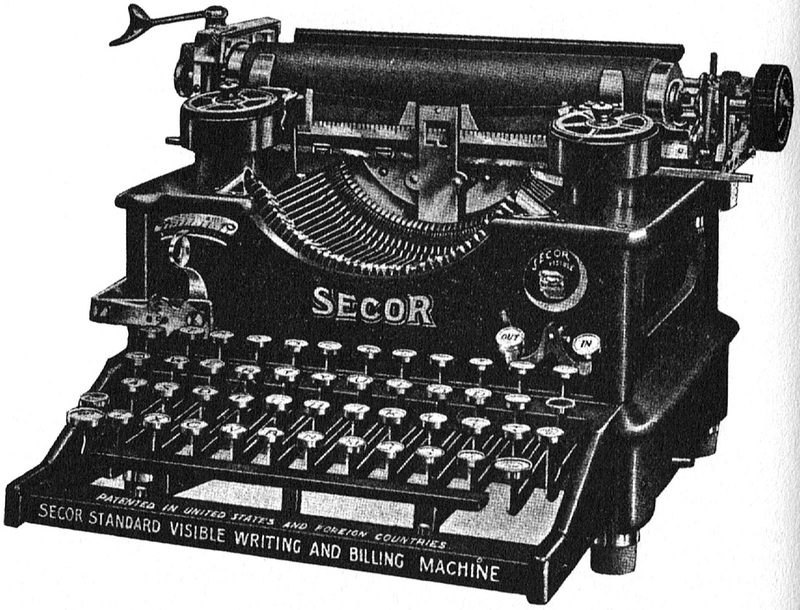 Secor also patented a cast iron clockwork locomotive and a small singing bird, or “mechanical warbler”. 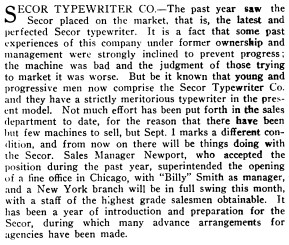 Secor went on to work for the Bullard Machine Tool Company and later resumed the manufacture of sewing machines. 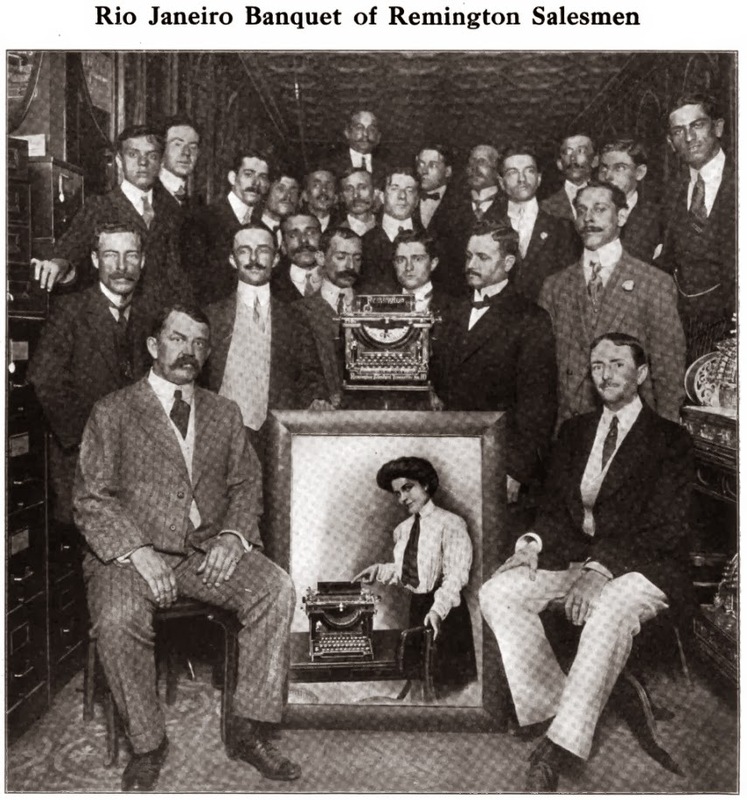 In 1899, he left Bridgeport for Derby to take charge of the Williams Typewriter Company. 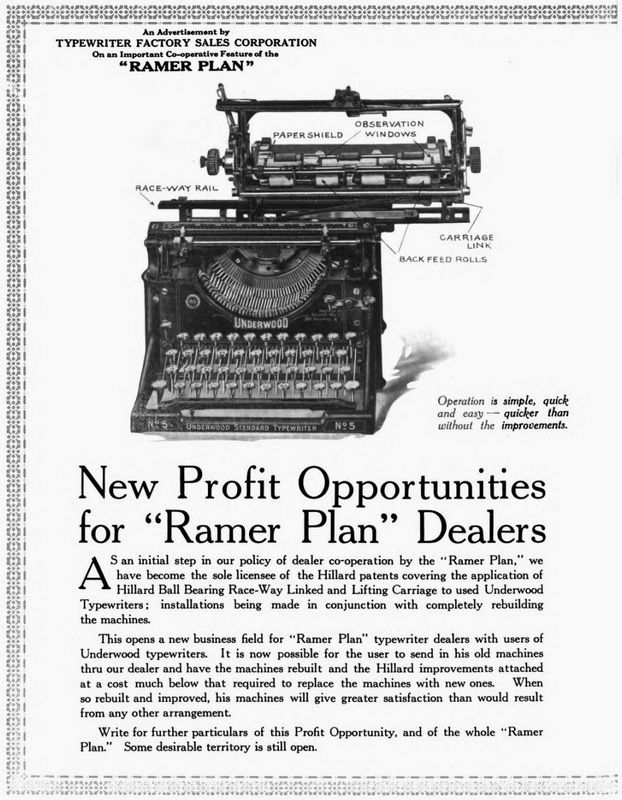 He had made the tools for this machine, and also for the American Typewriter Company. 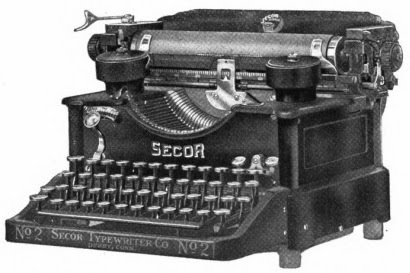 Secor took over the Williams company and the last-model 1904 Williams No 6 was made by the Secor Typewriter Company. The last Williams was produced in 1909. 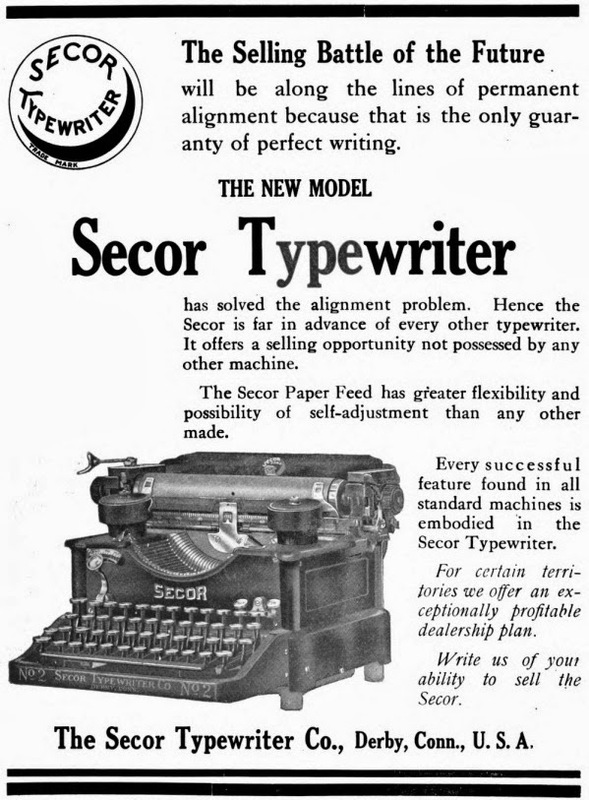 Secor created an entirely new machine, his Model 1, launched in 1906. 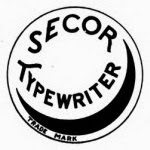 After the failure of his Model 2, Secor started making small tools and special machinery once more. During the First World War, he made tools for rifle production by Maxim and experimented with a rapid fire gun. He also took up the manufacture of small toys again. He retired in 1919 but still designed new machinery for the manufacture of rubber tires from a small shop in the attic of his house in Derby. He died on September 18, 1923, aged 84. This blog turned three-years-old today. This is its 1477th post. In about three weeks' time it will reach one million page views, and then the brakes will go on rather abruptly. This is the last monthly Typewriter Update. 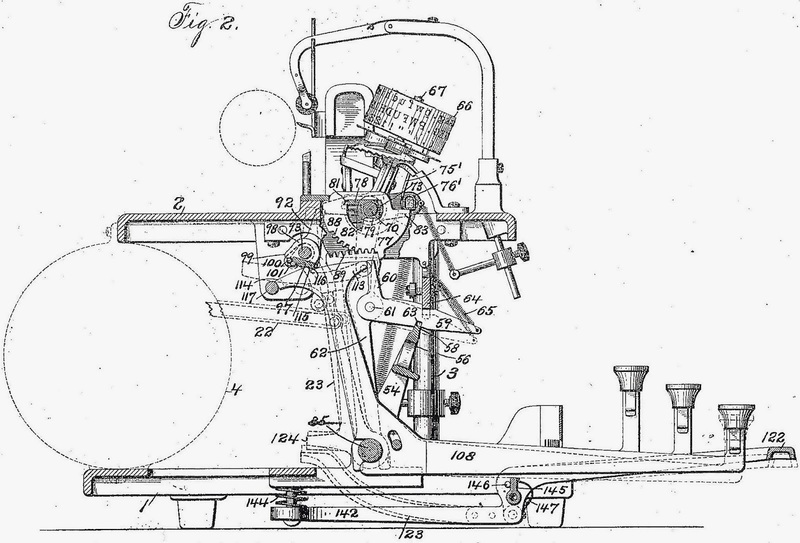 This electric Blickensderfer patent schematic will be used by theatre students at Duke University, Durham, North Carolina, to publicise April's staging of Machinal, by Sophie Treadwell. The play was inspired by the real life case of murderer Ruth Snyder, a secretary whose life was dictated by others. She murdered her oppressive boss-husband in the 1920s and was ultimately executed in the electric chair. 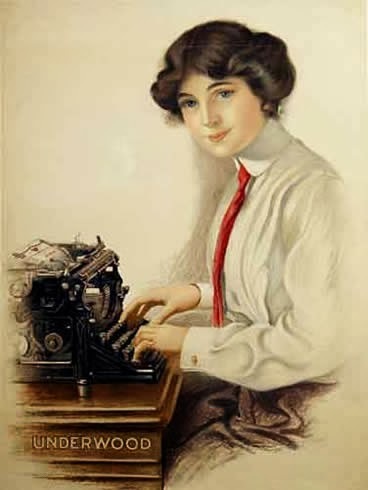 The students say the "typewriter is a symbol of her lot in life". Dean Jones waxed eloquent but put a starting price of one cent on this chromed Corona. It still fetched $651 on US eBay, after 80 bids. 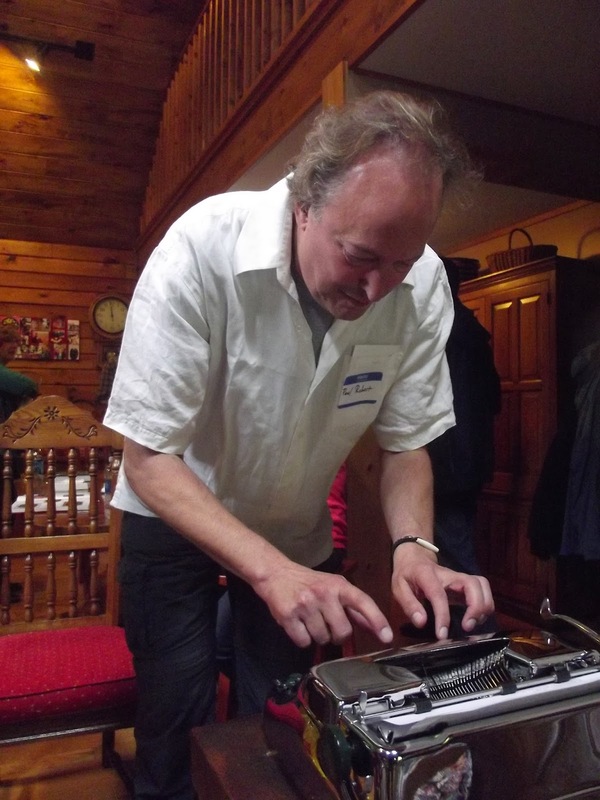 Dean wrote at least a couple of thousand words in his listing description, but what I'd like to know is this: Is it the same chromed Corona we used to type in at Herman Price's Typewriter Collectors' Gathering at the Chestnut Ridge Typewriter Museum in Fairmont, West Virginia, last October? A correspondent asked me if this Brother had a model name. I only know it as a Montgomery Ward Signature (variously the 088, 510D and 513, which the Japanese label the Model S-513). Another correspondent very kindly sent me this photo of her aunt in a typing contest in London in the early 1930s. 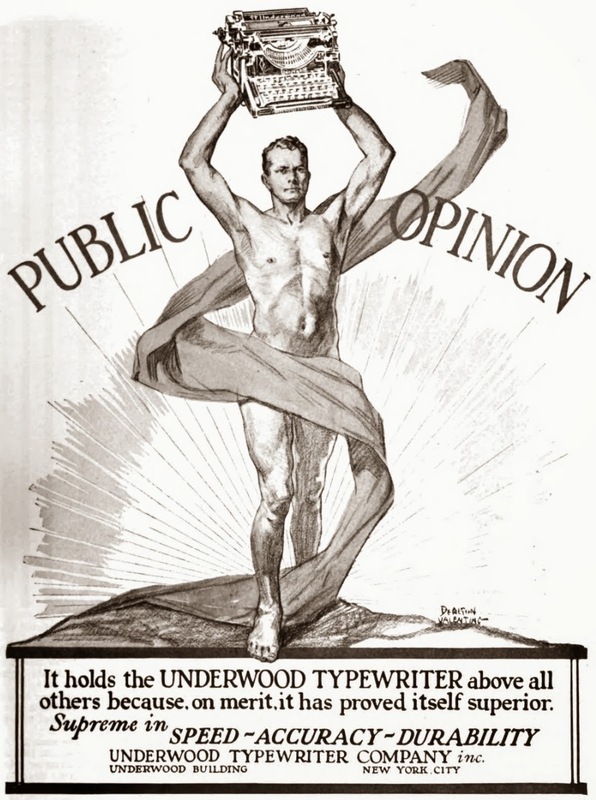 Copied by Underwood? 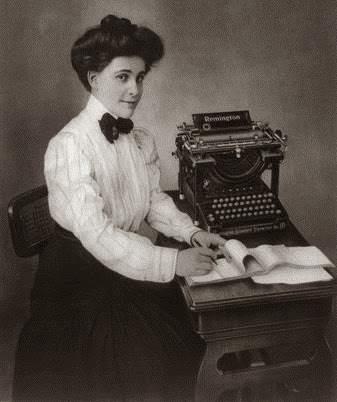 No, this is the All-Time Miss Typewriter! 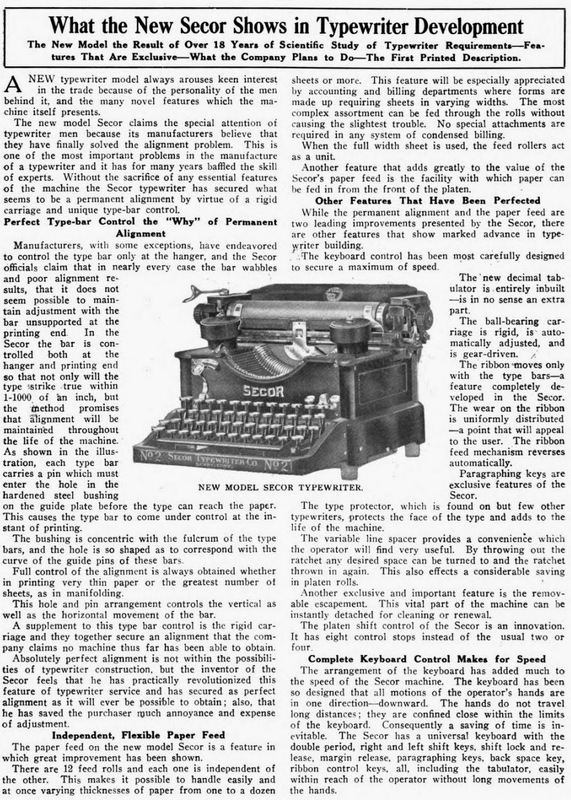 International Typewriter Appreciation Month got a mention in the Style Blog ("I Still Miss My Typewriter") of The Washington Post last week. The item began, "There’s something a little plaintive about this obscure annual observance [ITAM]. It’s a reminder of the charm (and - be honest - the frustration) we gave up to enter the computer age." The photo with the blog was taken in December 2012 of a visitor to the WBS70 Apartment Museum in Berlin's Hellersdorf district. WBS70 refers to the 70th series of concrete slab construction first used in East Germany in 1973. The apartment museum is furnished entirely with original East German fittings, including the Robotron (Erika) typewriter being used here. The museum opened in 2004 when massive renovation schemes were about to be implemented in the area. It stands as a living memorial to everyday life and design in the former East Germany. 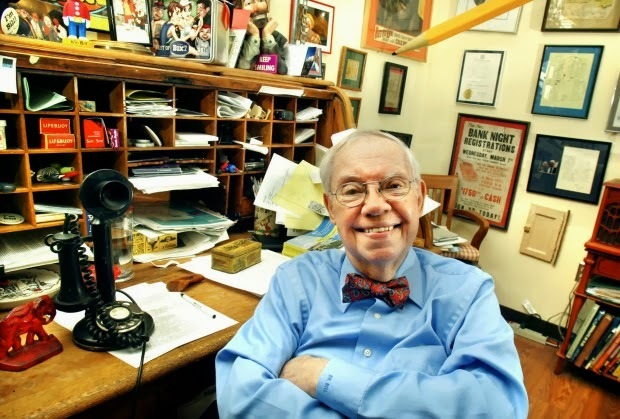 Bill Wundram (above) filed a column from Engelwood, Florida, for the Quad-City Times, headed "Tales from a Battered Typewriter". "My wife was clearing the shelf of our guest room closet here in Florida. It was stuffed with blankets and faded beach towels. She called out, 'What is this?' Hidden in a dusty corner was a flat, gray object. 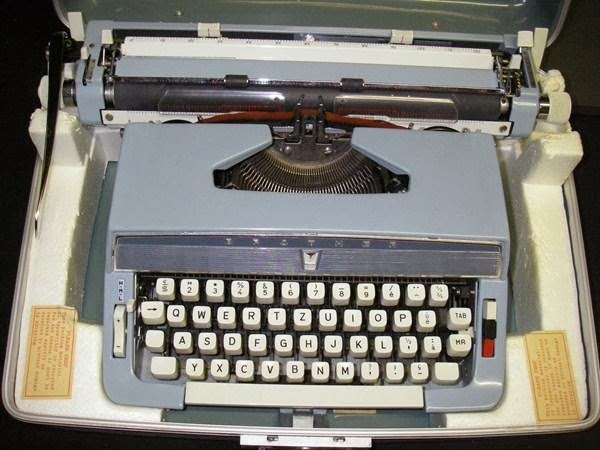 It was my tattered old Smith-Corona portable typewriter. It was an ecstatic moment for me. It was the one I had used, many years ago, when I was traveling almost around the world on those 'I'm With Bill' cruises that this noospaper used to sponsor. This was before email, so nightly I typed my columns in our stateroom. Helen lost sleep because the dinging bell at the end of each line kept her awake. I would take my typed copy to the radio shack on the cruise ship, where the radio operator would send it to the Quad-City Times. 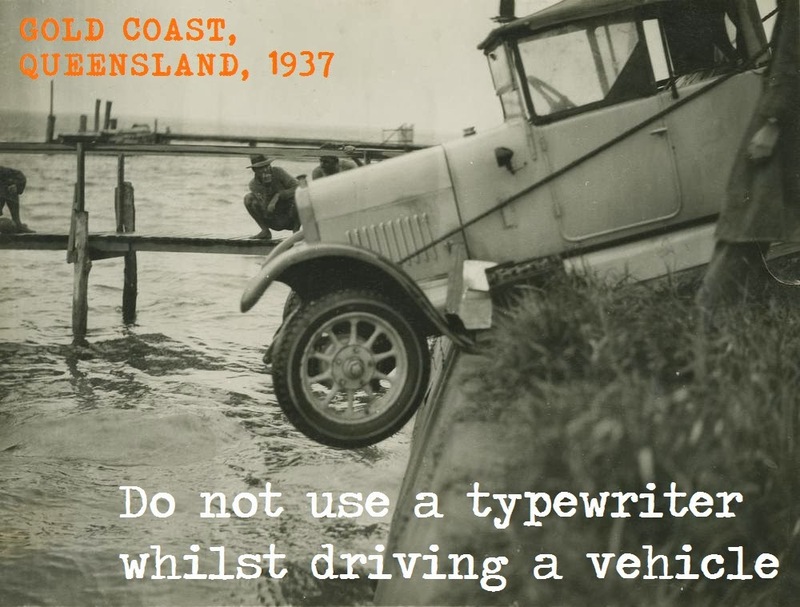 What tales that typewriter could tell ...". The rest of the column is here. 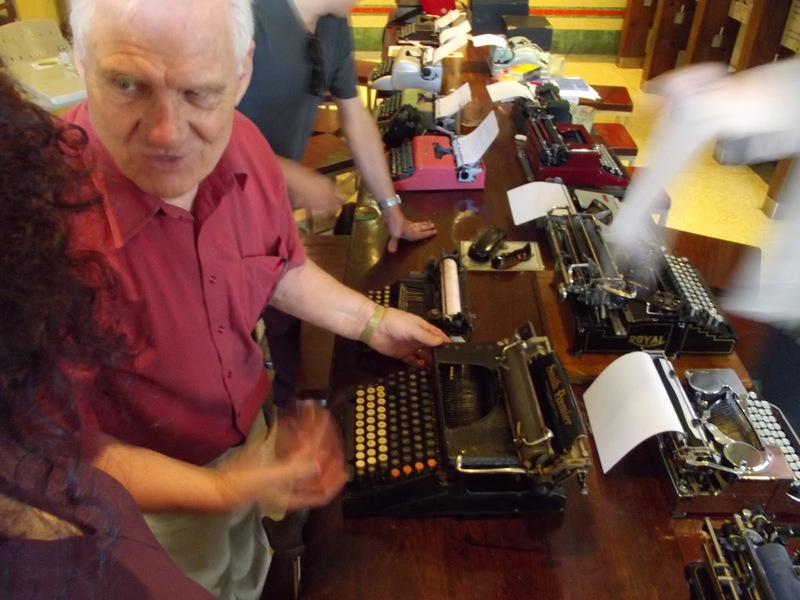 Magda Abu-Fadil, director of Media Unlimited in Lebanon, posted an interesting blog story titled "Of Telexes, Typewriters and Old-Fashioned Journalism" on the Huffington Post website. 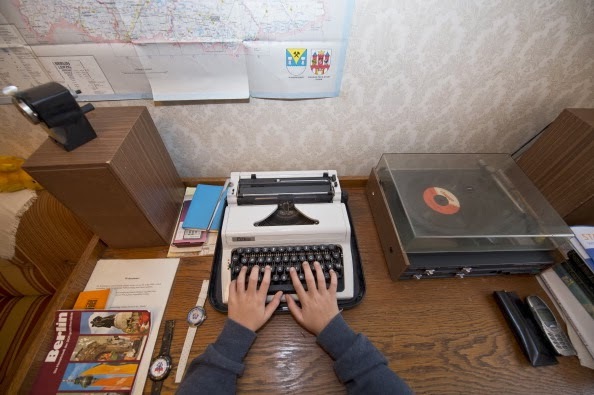 "What is it about telexes and typewriters that makes so many of us wax nostalgic?" she asked. "There's been a spate of articles lately extolling the virtues of those magnificent machines one usually sees in museums, and occasionally in people's homes or offices. I was amused when Pascal Taillandier, the editorial production manager at Agence France-Presse (AFP), posted a picture on LinkedIn of a man punching a telex tape in the back of a van as curious children looked on through the open doors. 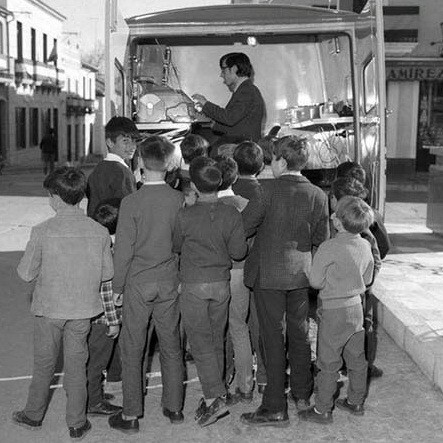 The 1969 black and white photo in the Spanish town of La Carolina was part of a series marking the 75th anniversary of Spain's EFE news agency. It took me back many years [to] when I filed stories from various capitals via telex for UPI and AFP and reminded me of the infernal noise it made." 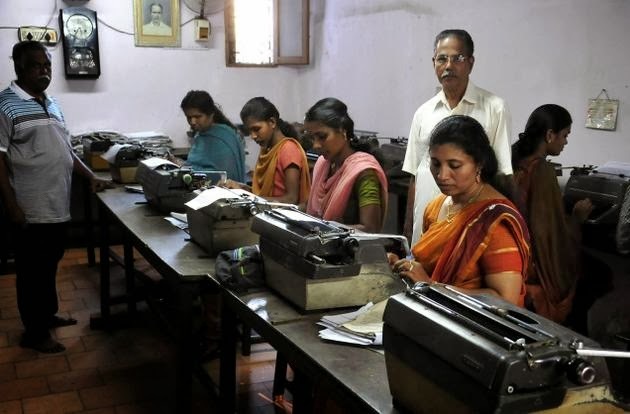 Also see "Silence of the Typewriters" at The Hindu. Angelina Jolie is wrapping up the filming in Australia of the movie Unbroken, a war drama scripted by Joel and Ethan Coen and based on the New York Times No 1 bestseller by Laura Hillenbrand (author of Seabiscuit). 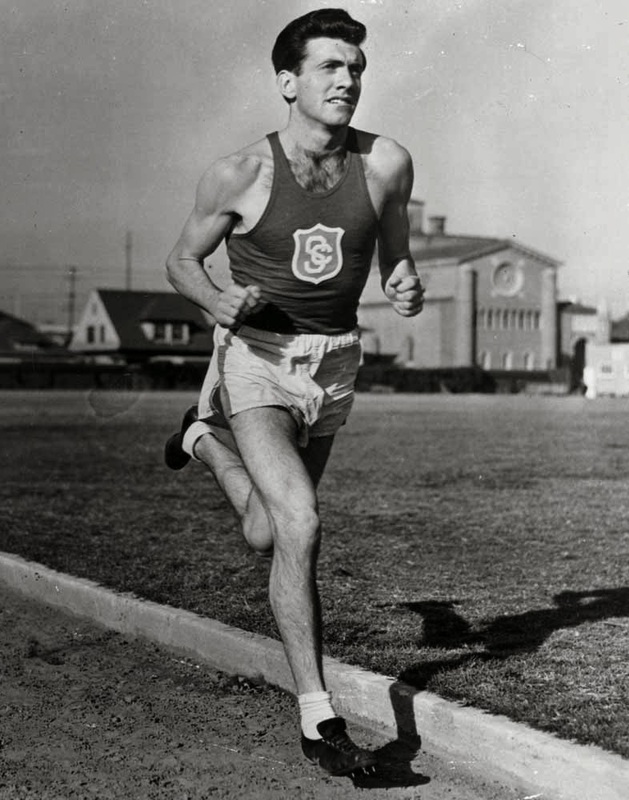 The movie is about Louis Zamperini, who ran for the US in the 5000 metres at the 1936 Berlin Olympic Games (he came eighth) and later became a Japanese prisoner of war. 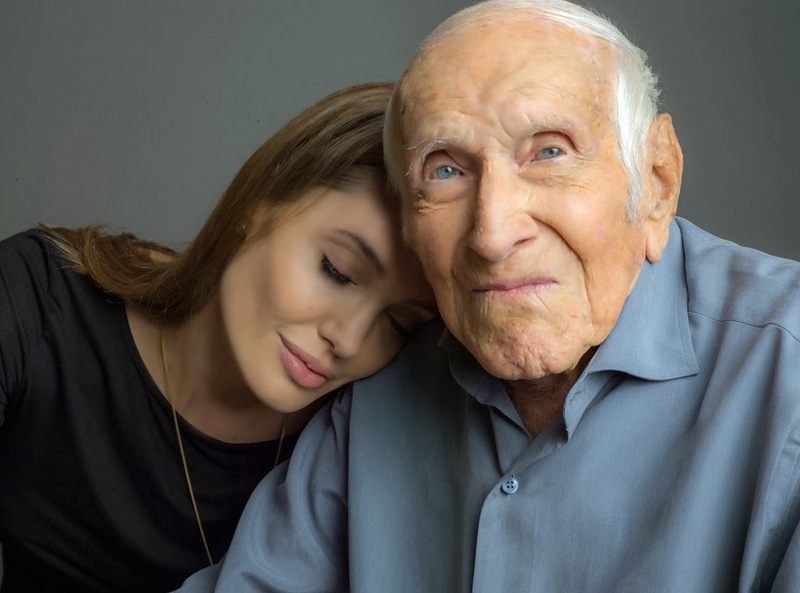 Zamperini, who turned 97 a month ago and is a near neighbour of Jolie in the Hollywood district of Los Angeles, is being played by Jack O'Connell. 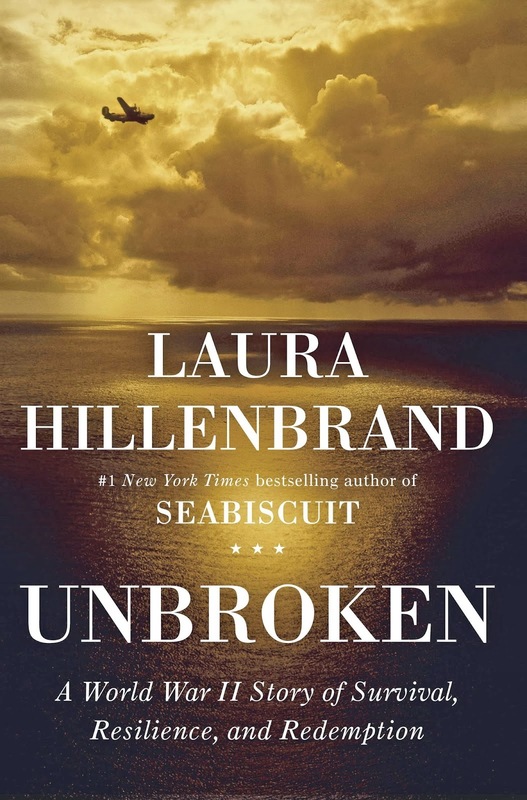 In Hillenbrand's 2010 book Unbroken: A World War II Story of Survival, Resilience, and Redemption, the author describes the scene after the Japanese bombing of a tiny Pacific island. 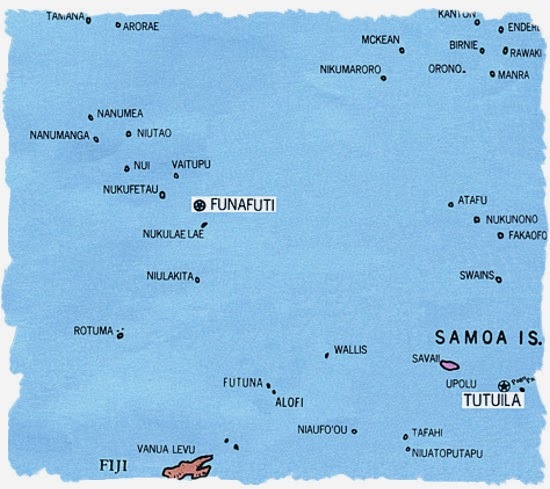 "Funafuti [where Zamperini was a bombardier on a B-24 Liberator bomber] was wrecked. A bomb had struck the church roof,s ending the building down onto itself, but thanks to Corporal Ladd, there had been no one inside. There was a crater where Louie and Phil’s tent had been. Another tent lay collapsed, a bomb standing on its nose in the middle of it. Someone tied the bomb to a truck, dragged it to the beach, and turned sharply, sending the bomb skidding into the ocean. Rosynek walked up the runway and found six Japanese bombs lying in a neat row. The bombs were armed by spinning as they fell, but whoever had dropped them had come in too low, not leaving the bombs enough drop space to arm themselves. The men dragged them into the ocean too. 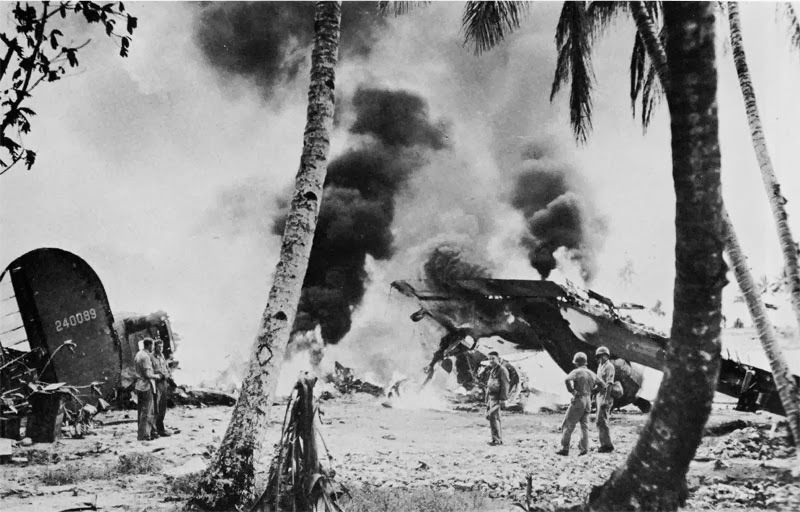 Where the struck B-24s had been, there were deep holes ringed by decapitated coconut trees. One crater, Louie [Zamperini] noted in his diary, was 35-feet deep and 60 feet across. Bits of bomber were sprinkled everywhere. Landing gear and seats that had seen the sunset from one side of Funafuti greeted the sunrise from the other. All that was left of one bomber was a tail, two wingtips, and two propellers,connected by a black smudge. There was a 1200-horsepower Pratt and Whitney engine sitting by itself on the runway; the plane that it belonged to was nowhere to be found. "Louie came upon a reporter staring into a crater, in tears. Louie walked to him, bracing to see a dead body. 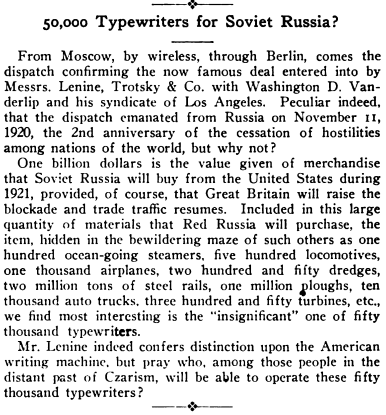 Instead, he saw a typewriter, flattened." Zamperini survived a plane crash in the Pacific Ocean 850 miles west of Oahu, spent 47 days drifting on a raft, reached the Marshall Islands and was immediately captured by the Japanese Navy. He was then held for more than 2 1/2 years in several brutal Japanese internment camps. 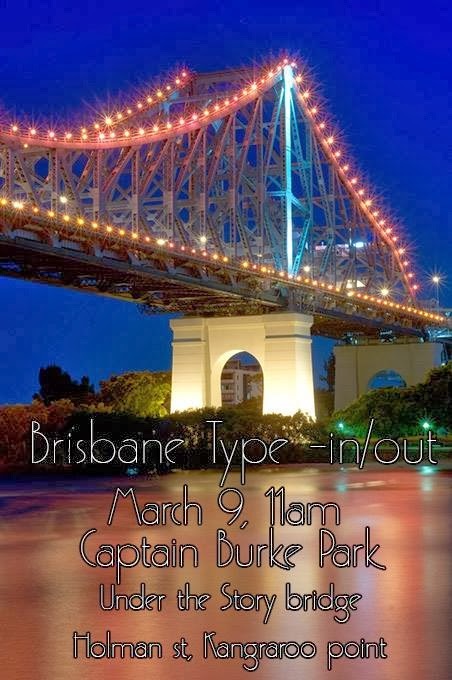 Typospherians from around Australia will gather under the Story Bridge in Brisbane on the Sunday morning of March 9 to fulfil a promise made at the end of the first Australian Type-In, at the Breakfast Creek Pub in Brisbane on March 10 last year. That is, to meet one year hence and hold the second Australian Type-In! I think it was my first comment in Russian. In case anyone was wondering about it, it came from Irina Semiletova and was about a post some weeks ago on two Americans caught spying in England for Russia. Irina said, "No country is without spies ... Another thing - to recognise the truth or ignore it. Thanks for the story! All this is sad: born in US, to live a double life in the United Kingdom, and instead of their own island, like Somerset Maugham, not to end up in the most comfortable country." 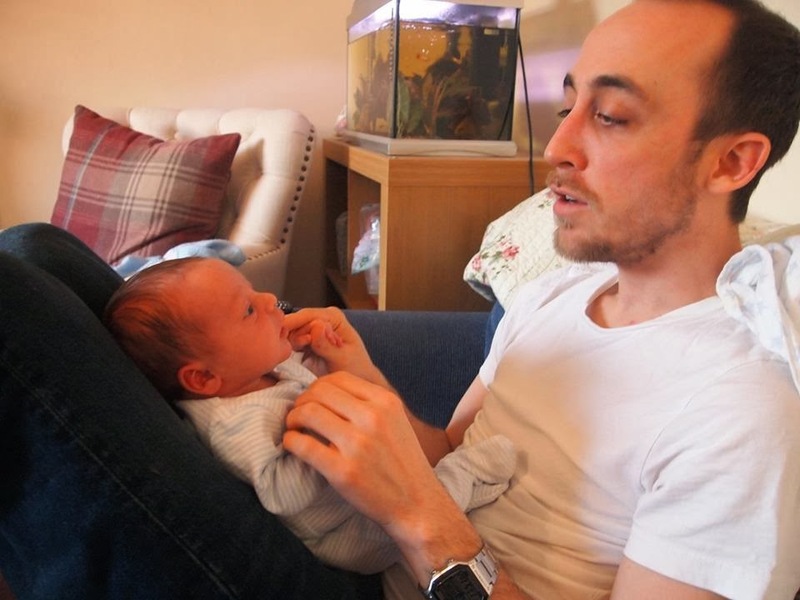 I became a grandfather for the first time this week when Isaac was born in Bristol, England, to my son Simon and his partner Nicola. 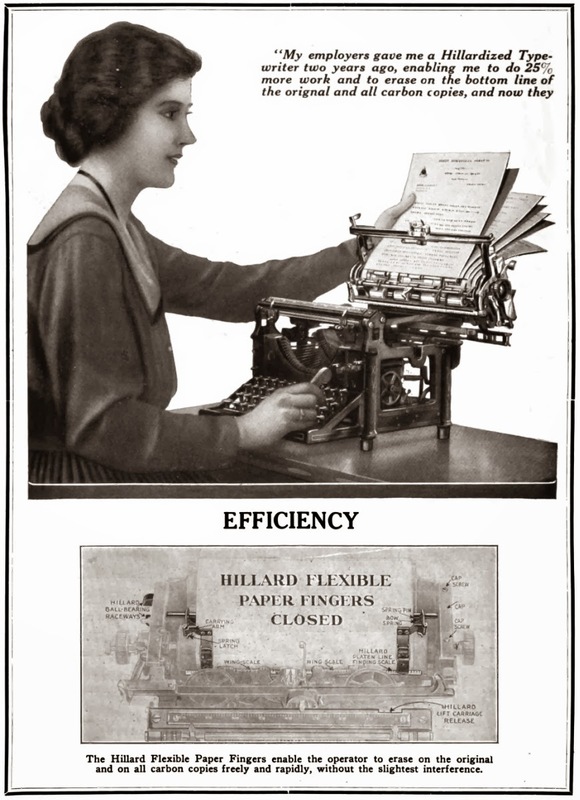 On this day in 1919, Frederic Whittlesey Hillard first applied for a US patent for the process which became known the next year as "Hillardizing" Underwood typewriters. 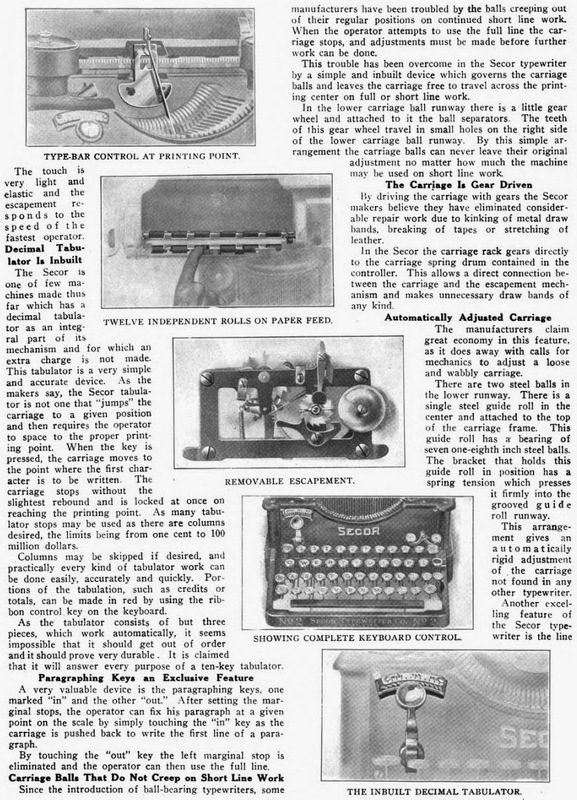 Appropriately, he assigned the patent to his own Typewriters Hillardized Inc.
Hillard wrote of his invention that it was "an improvement in anti-friction or ball bearing supports for the carriage of a typewriter. 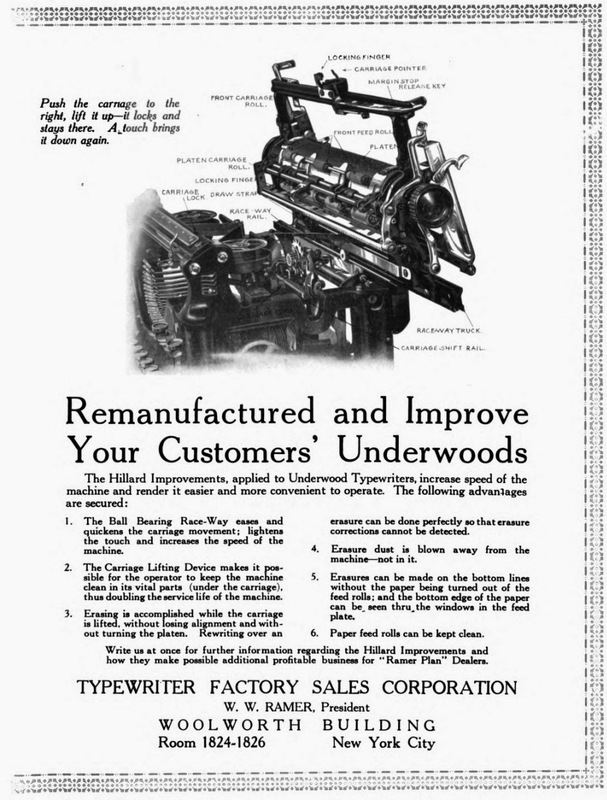 The improvement is herein illustrated as applied to the well-known Underwood typewriter, for which instrument it was particularly designed, but this is illustrative only, as the invention has wide application and is not limited to any special form of machine, but applicable generally where the other features of construction and operation permit. 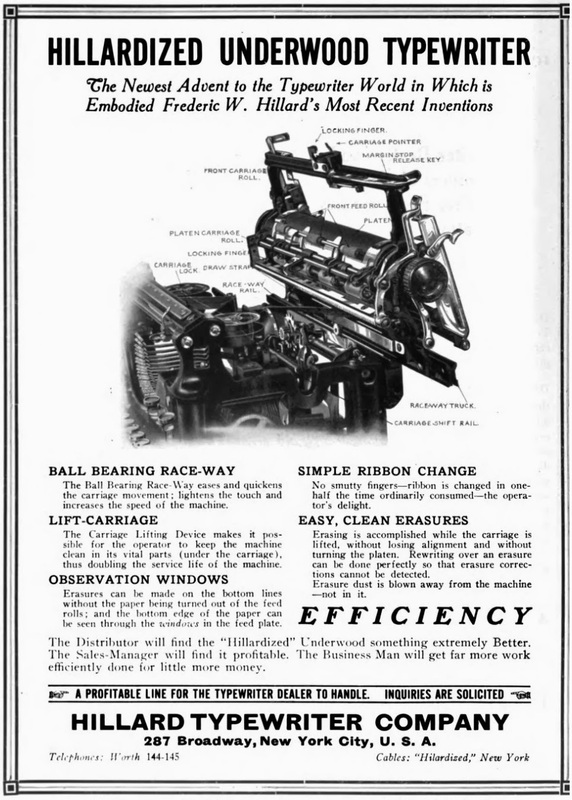 The chief object of the invention is to secure an easy running and rapid feeding carriage in a visible typewriting machine and at the same time provide a carriage which may be readily swung upward that the parts of the mechanism thereunder may be readily inspected, repaired and cleaned. This swinging movement of the carriage also is an advantage in that the writing may be inspected practically to the last line on the sheet and the operator by so swinging the carriage can readily tell just how much space is left at the bottom of the sheet or card." 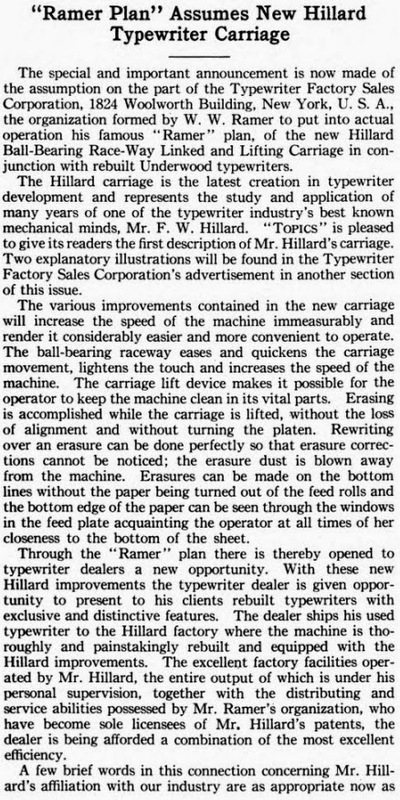 I covered much of Hillard's typewriter-inventing career in a post in this series in August 2011. 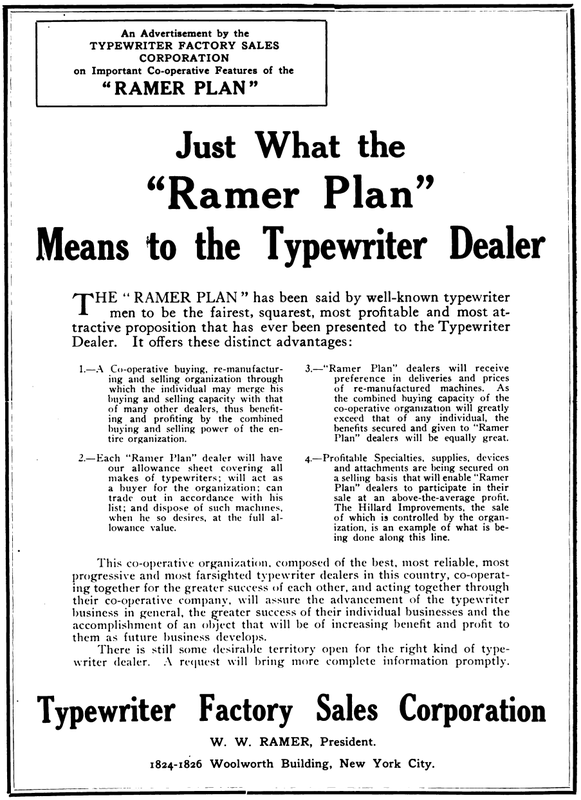 In all he was issued with 29 typewriter-related patents during a 31–year period between 1897 and 1928. Hillard’s sister, Mary Robbins Hillard (below; 1862-1932), of Middlebury, Connecticut, to whom Frederic assigned three patents between 1915 and 1921, donated Frederic’s papers to the Connecticut Historical Society, where they are still held. Some 150 of his letters relating to his patents for typewriters and typewriters parts, covering 1902-1931, now rest in Hartford. 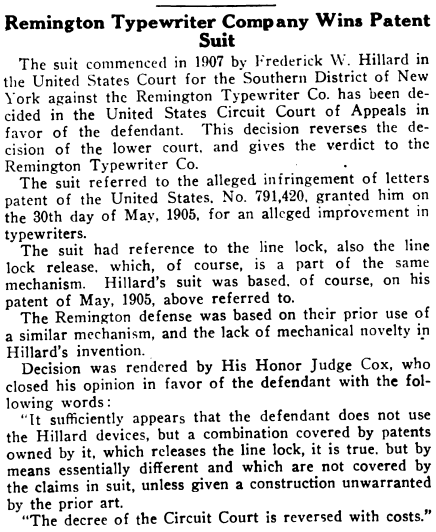 In 1908, Hillard was also involved in a patent infringement case against the Fisher Book Typewriter Company in the Federal Supreme Court. Fisher issued a petition for a writ of certiorari to the United States Circuit Court of Appeals, which was denied. A writ of certiorari means an order by a higher court directing a lower court to send the record in a given case for review. 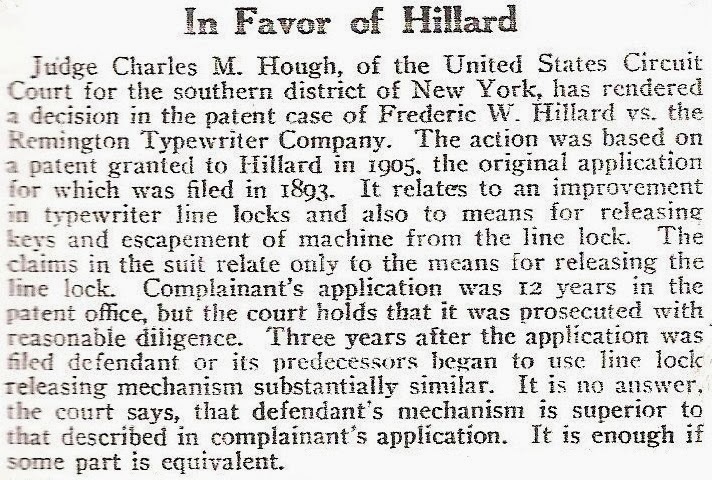 This case ended Hillard’s association with the book typewriter. 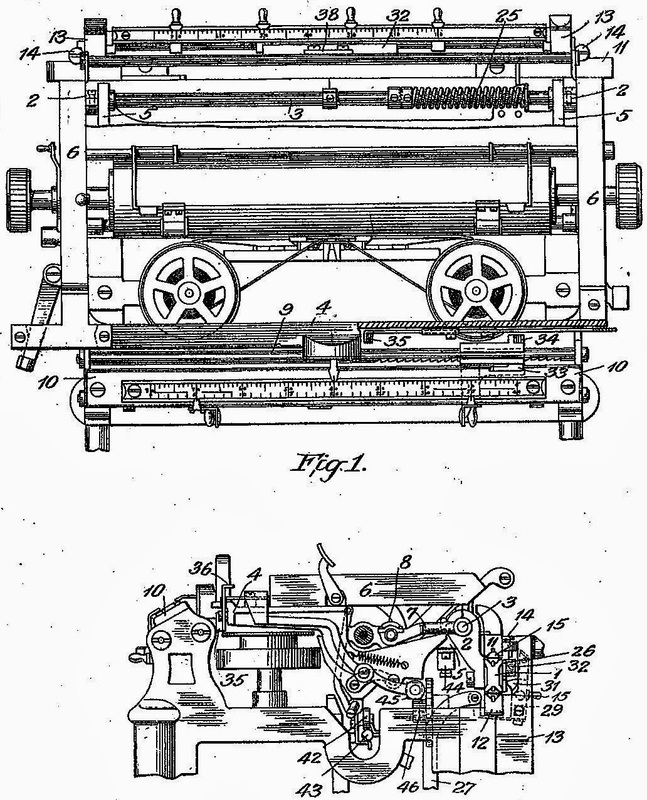 Twelve of Hillard’s 29 patents were related to the Elliott book typewriter. 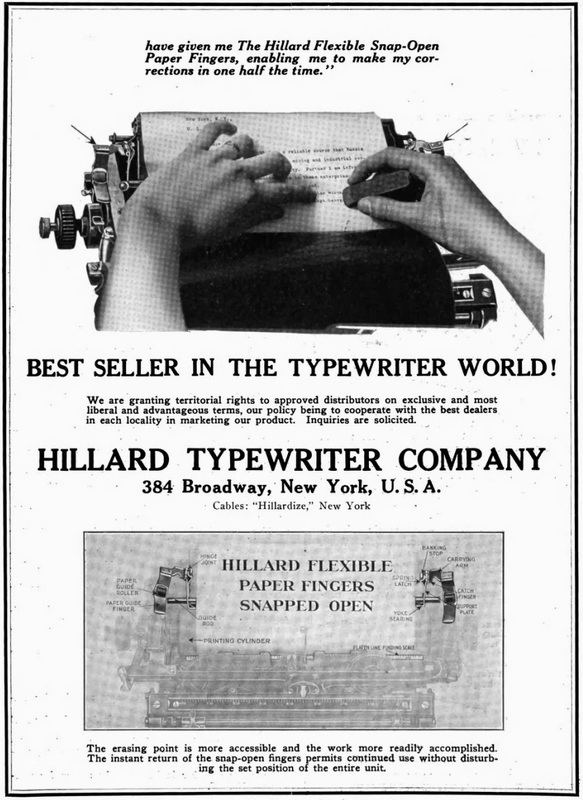 Hillard began working with Walter Platt Hatch in 1894 when the assignee was known as the Elliott and Hatch Book Typewriter Company. 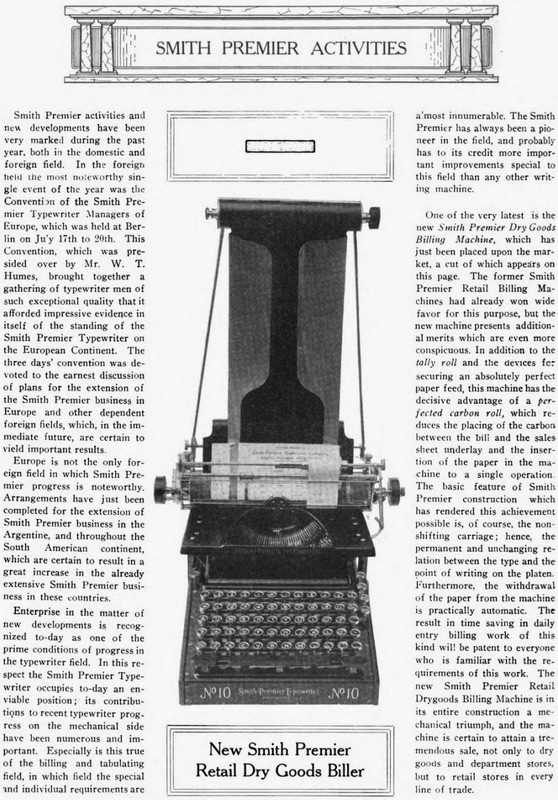 Hatch had jointly developed the book typewriter with George Crawford Elliott. 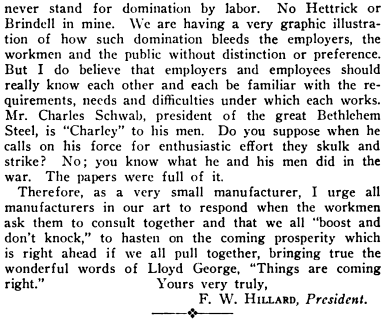 Hillard continued to work on improvements for this machine when the assignee became known as the Elliott-Fisher Company. 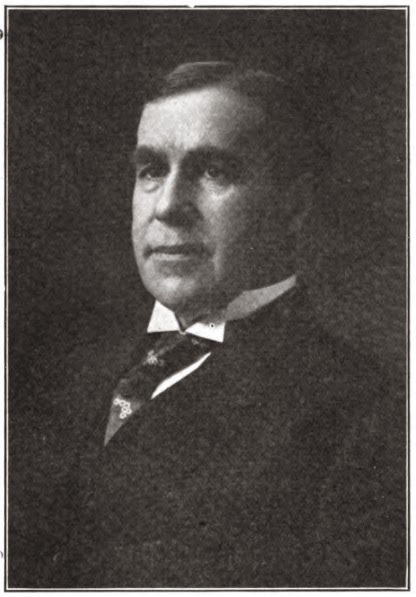 The change of company name occurred with Robert Joseph Fisher’s involvement in 1903. 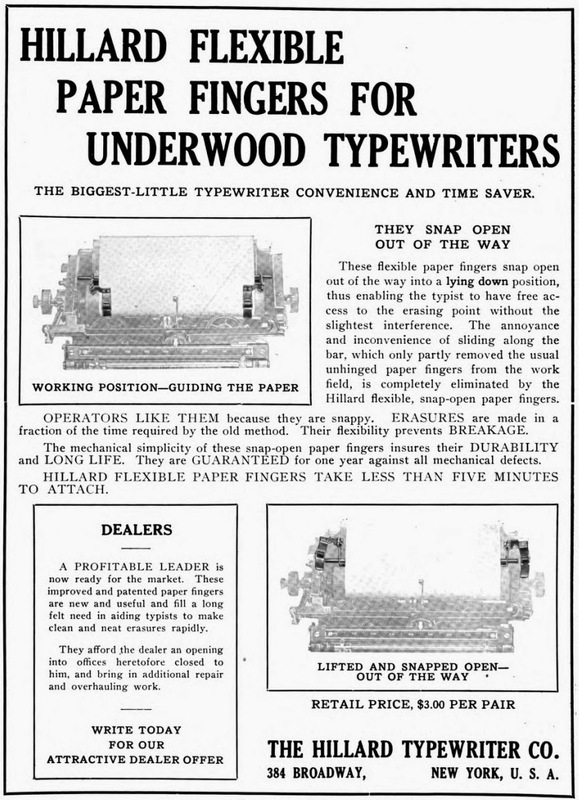 Later Underwood bought out the concern, so the machine became the Underwood-Elliott-Fisher. 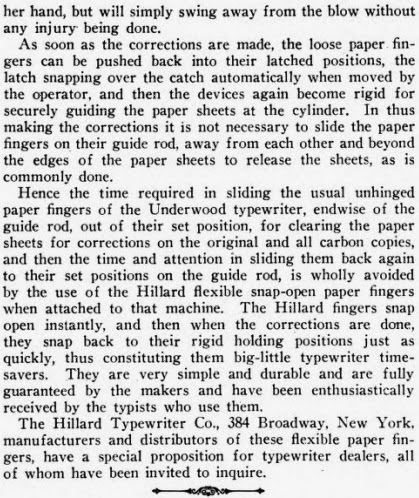 After the "Hillardizing" exercise, Hillard went on in 1922 to develop "flexible paper fingers" for the Underwood, a troublesome venture which almost brought about Hillard's premature death. 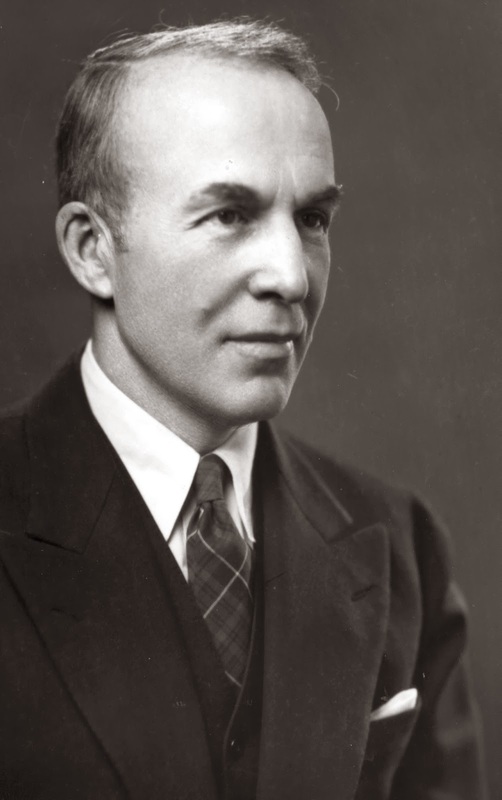 *Hillard's nephew, Archibald MacLeish (above, 1892-1982) was born in Glencoe, Illinois. 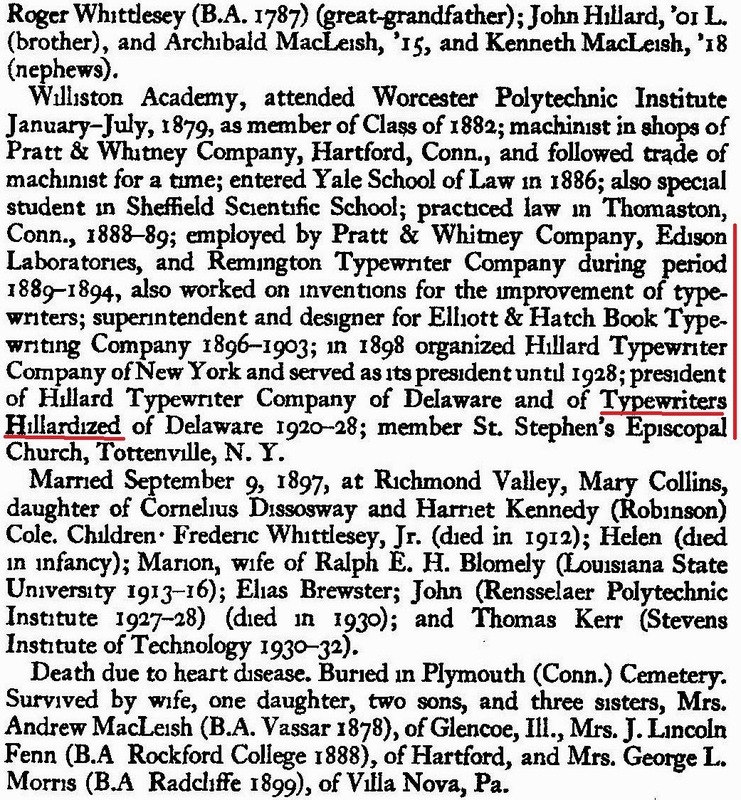 His mother, Martha "Patty" MacLeish (1856-1947), Hillard's sister, was a Vassar garduate, college professor who served as president of Rockford College.